The King of analog modeling synths. KingKORG is the full-fledged analog modeling synthesizer you’ve been waiting for. It carries on the design philosophy of classic Korg analog synthesizers such as the MS-20 and the Mono/Poly, which gave rise to the Prophecy, the Z1, the MS2000, and the RADIAS. This exciting new instrument delivers the unique characteristics of a dedicated synthesizer, especially the fun of transforming the sound by tweaking an impressive array of knobs. 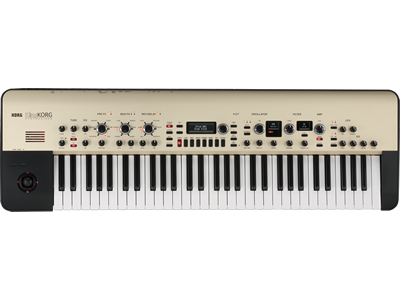 While technologically impressive, KingKORG is approachable even to players who are new to synthesizers. And it particularly shines on stage, not only with its great sound, but also literally with a gorgeous champagne gold finish, befitting its royal name – KingKORG. 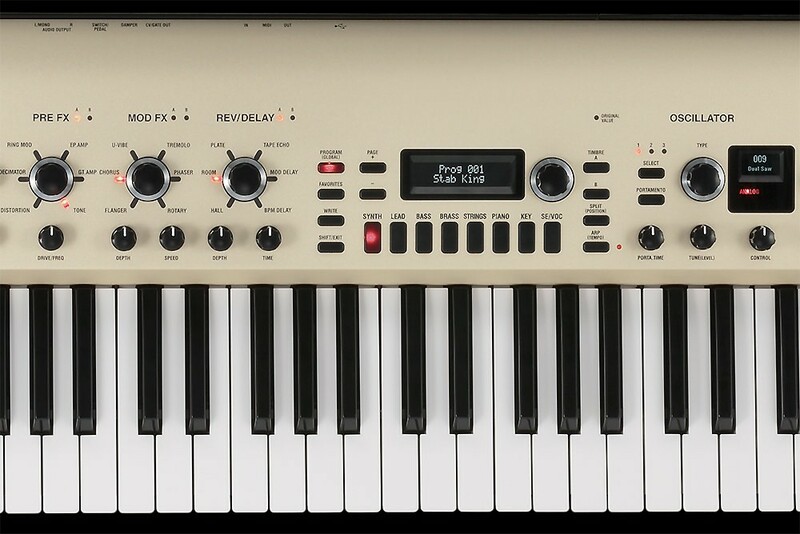 KingKORG features a 3-oscillator x 2-timbre design allows you to generate thick and rich sounds, plus a newly developed XMT modeling sound engine. XMT (Xpanded Modeling Technology) is proprietary Korg. 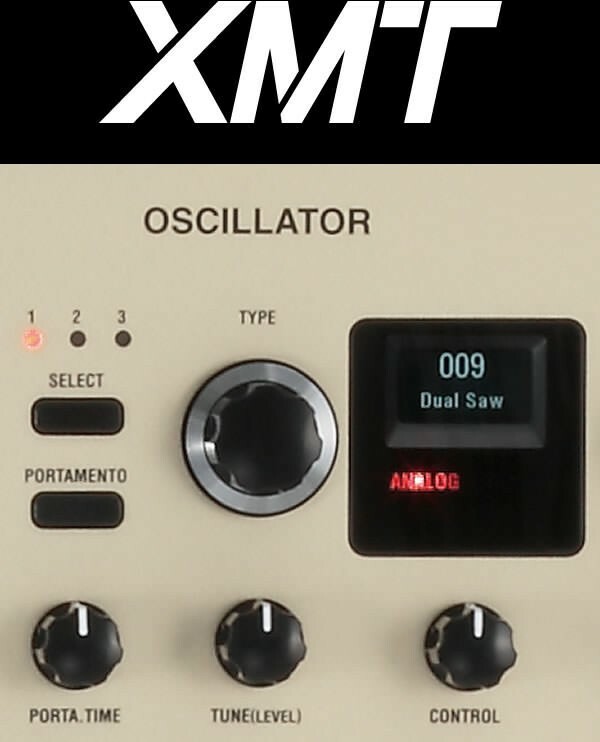 XMT was created specifically to offer a wide variety of sounds, while keeping operation simple. In a conventional synthesizer, the sound-creating process requires you to adjust the oscillator settings one by one, making it difficult to see the overall picture. In contrast, KingKORG provides pre-set algorithms that contain combinations of various types and numbers of oscillators, letting you easily and quickly sculpt stage-ready sounds. The wide range of oscillator algorithms includes the choices you’d expect from an analog synthesizer–sawtooth wave, square wave, and noise–in addition to numerous PCM/DWGS algorithms, giving you plenty of choices for creating highly personal sounds. 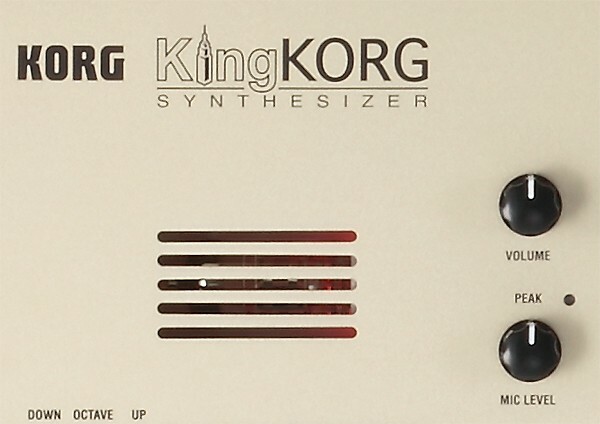 While designing KingKORG, extreme attention was paid to the filter section, which is crucial to any synthesizer’s character. 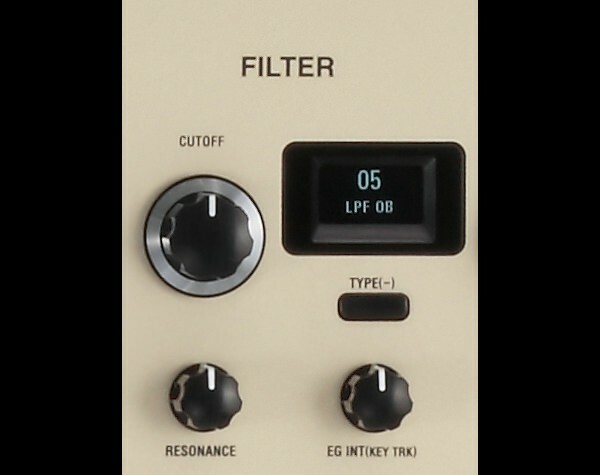 A diverse variety of filters is a unique advantage when it comes to analog modeling, and KingKORG’s filters add unparalleled flexibility. 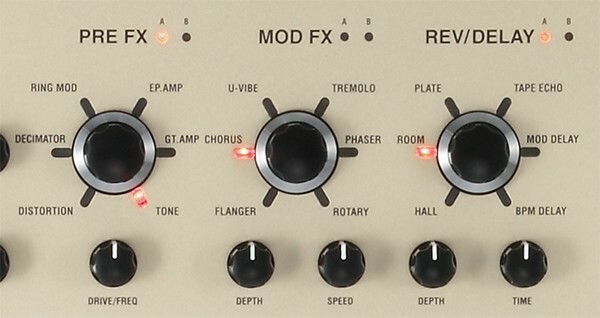 In addition to a variety of essential analog modeling filter types, you get faithful models of filters that reproduce the analog monophonic synths used for lead and bass in the ’70s, the polyphonic synths used in new wave music of the ’80s, and the filters of Korg’s classic MS-20 analog synth. The built-in vocoder uses audio from the onboard mic input to modify the sound, creating an effect as though the synthesizer were talking. Kingkorg’s vocoder features Formant Shift to dramatically modify the tonal character, as well as Formant Hold, which allows you to “freeze” a vowel sound and play it back using the keys. Thanks to the KingKORG’s dual-timbre architecture, you can even combine the vocoder with another timbre, either as a complementing sound or a modulation source. The newly designed panel is organized into blocks that let you focus on the controls you need while editing. While reflecting the concept of an analog synthesizer’s signal flow, KingKORG’s front panel takes full advantage of today’s technology. For example, the oscillator section has its own dedicated display that shows the name of the currently selected algorithm. You can turn the dial located beside this display to see descriptive names, and push the dial to jump to the beginning of categories such as ANALOG or DWGS. 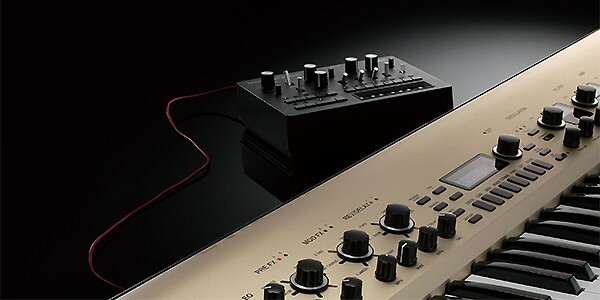 The control knobs are assigned to the most effective and important parameters for each oscillator, letting you enjoy the unique feature of an analog synthesizer — turning the knobs to transform the sound. There are also dedicated dials for each of the three master effects, making it easy to try out different effects and hear how they modify the sound. Since a self-luminous organic EL display is used, visibility is excellent even on a dimly lit stage or in direct sunlight. 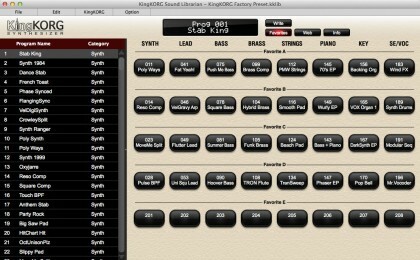 KingKORG provides a diverse selection of 200 stage-ready preset programs organized into eight categories such as Synth, Lead, and Bass. 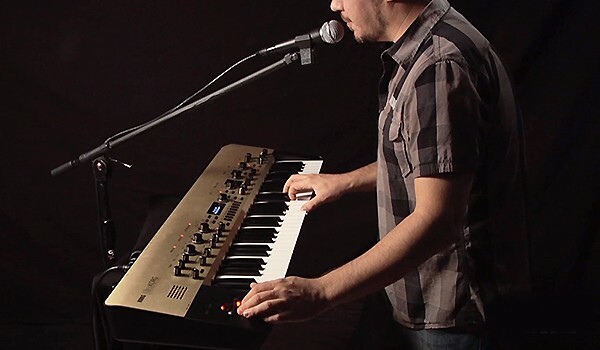 There’s a great selection of the staple sounds you need for live performance, including numerous PCM sounds for piano, electric piano, organ, and clavinet. Thanks to KingKORG’s ability to emulate filters from classic synthesizers, you’ll find familiar and authentic sounds that are perfect for playing your favorite classic and modern songs, along with new and inspiring sounds to broaden your horizons. 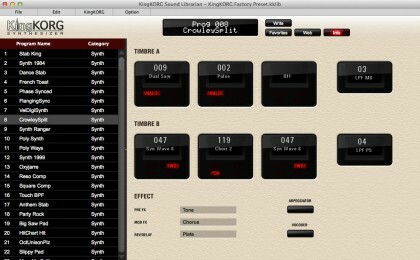 There’s also a user area for you to store 100 of your own sounds.